Under the rules of superannuation in Australia, you are allowed to choose the superannuation fund you want to belong to and your employer, generally, must make Superannuation Guarantee contributions to the fund you have selected. So if you’ve been happy with the benefits you have received from AMIST Super, you can maintain your membership when you change jobs, even if you leave the meat industry all together. Your AMIST Super membership can go with you anywhere. All you have to do is complete a Choice of superannuation fund Standard choice form below, nominating AMIST Super as your preferred fund, and click the “Email this to me” button below. Then you can give the completed form to your new employer by either printing it out for forwarding the email. If you are a registered AMIST Super employer (that is, you already pay contributions to AMIST Super on behalf of other members), you can simply continue using your current payment method for your contributions. 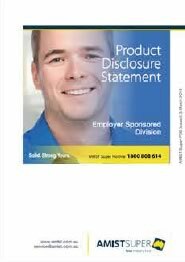 Become a registered employer by contacting AMIST Super on 1800 808 614 or visiting www.amist.com.au. You will then be able to enjoy additional flexibility in making payments such as direct debit or BPAY®. Use an existing payment process you have in place to forward payments to super funds, for example, a clearing house. AMIST Super’s complying fund letter is available at www.amist.com.au. Please retain for your records. IMPORTANT: This form is for your employers records only - do not send it to AMIST Super. This form can be used instead of completing Part A of the Choice of superannuation fund — Standard choice form which you may have received from your employer. Some employees may not be able to choose their own superannuation fund. Please speak to your employer for more information.